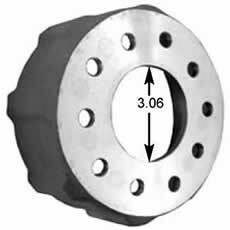 These cast aluminum rotor mounting hats are designed for use on sportsman or late model type race cars. They are available to fit all common wheel bolt patterns. The rotor mount pattern fits the popular 8 bolt 7" B.C. brake rotors. 6.600 inside diameter. - Select - Hat-Cast Aluminum-5 X 4-1/2",5 X 4 3/4"-5"-1/2" Studs-2 1/2" Hat-Cast Aluminum-5 X 4-1/2",5 X 4 3/4"-5"-1/2" Studs-3" Hat-Cast Aluminum-5 X 4-1/2",5 X 4-3/4",5 X 5"- 5/8" Studs-2 1/2" Hat-Cast Aluminum-5 X 4-1/2",5 X 4-3/4",5 X 5"-5/8" Studs-3"